It's hard to ignore Mount Hood as you approach the Portland, OR area. The WINs are staying at a Sno Park in Government Camp, but Phil and I stopped just long enough to run up and see Timberline Lodge. I had meant to go an a short hike, but it looks like there is way too much snow. You can still ski right down to the parking lot. While we were waiting to go on their free tour, we wandered around. The doors were certainly impressively large. As was the multistory fireplace. Near the entrance is a mosaic entitled " Spring on the Mountain," featuring local plants and animals found in the area. When our tour started, Phil and I were the only ones on it. We got taken down to the Blue Ox Bar, not normally on the tour because it isn't open for the season yet. The glass mosaic murals of Paul Bunyon and Babe, the Blue Ox were really special. And the tables and chairs were part of the original furnishings of the lodge. They've been etched by a lot of the previous visitors. The door is tiny, because it used to be a storage room, until they realized that the lodge did not have a bar in it. After we left the bar, a whole bus load of tourists joined us. Our guide was great - he was the guy in charge of the tours, and his interns who usually give the tours hadn't arrived yet. From here we're moving on to the Portland area. One day, when it warmed up a bit, we took a trip to Tumalo Falls. Only 3.4 miles from where we were parked as the crow flies, it was 25 miles to drive. But well worth it! The main waterfall, 97' tall, is only .2 miles from the parking lot. I love the lava rock around the falls. We hiked up the trail, and as we got closer to the top, you could see a rainbow in the spray from the waterfall. Walking farther up the trail, you pass numerous small waterfalls, then arrive at the next biggie, Double Falls, about a mile from the parking lot. At this point, we turned around and went back to the parking lot, then discovered another trail that goes to the base of Tumalo Falls. A chance for me to get a shot of the falls from a different perspective. Afterwards, we drove up to the top of Pilot Butte in town. A great view of the town and all the mountains/volcanoes in the area. Back at our camping spot, a group of long-distance horseback riders moved in. They had a variety of races going on, up to 100 miles, which had to be completed in 24 hours. We enjoyed the show. On our last day in Bend, we went for a hike along the Deschutes River. Once again, the lava rock was beautiful. This is a popular rafting area, and we got to see a couple. One cold day, we went on a tour of Newberry National Volcanic Monument near Bend, OR. I didn't realize how high in elevation we were going when I planned it for this day. Our first stop was Paulina Falls, an 80-foot waterfall plunging over volcanic cliffs. Gorgeous, even with the bad weather. We then moved on to the Big Obsidian Flow, which contains the result of Oregon's most recent eruption 1300 years ago. The big chunks of obsidian are just beautiful. The flow is a mile long, and 10% obsidian and 90% pumice. Do we look cold or what? Wait a minute! What's this white stuff??? When we were at the top, it started sleeting! Next we went to Lave River Cave. 100,000 years ago lava flowed through the tube. From there we drove up to the top of Lava Butte cinder cone, and walked around the edge. There are only 10 parking spots at the top, so you must get a permit and only have 1/2 hour at the top. Since it was such a crappy day, we lucked out. On another day, we went to the Rhubarb Festival in LaPine. Lots of fun, with over 400 rhubarb combination pies. You could buy samples of lots of them, and 5 samples was enough for lunch for me - all dessert. But the best part was that the festival took place at a nursery and antique shop that had lots of rusty stuff! If I had a house with a garden, I'd go crazy here. Lots of vendors at the festival too! We were parked at a Sno Park outside of town, which had a cabin complete with pot-belly stove that we could use to escape the cold. A great place to play games and eat snacks. What a great town! I Thought I Loved Weed, but I Love Bend Even More! Bend, Oregon has been one of my favorite towns for many years. Th WINs are here for 10 days, and there is plenty to do. The town is full of breweries, and we hit Deschutes Brewery first - free samples! For those of you that read Jim and Gayle's blog, you may recognize their friend Debbie on the right. She's a brand new WIN, and we love having her. Bicycling is also big here, and you can mix beer and bicycling by cruising downtown Bend on the Cycle Pub. But to me the best part of Bend is the many lakes west of town. 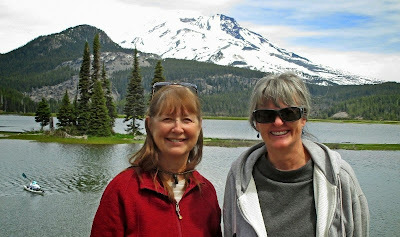 My very favorite is Sparks Lake, complete with lava, islands, flowers, and a volcano, South Sister, in the background. And you can kayak here! Flowers seem to just grow out of the lava rocks! Another one of our new members is Kim, of Kimbopolo fame. She has a great blog that I've been reading for a while, and I'm really enjoying getting to know her. While we were at Sparks Lake, a truck pulled up to dump 650 Cutthroat Trout in the Lake. Too bad I don't fish, this would have been a real opportunity. From there we went to Hosmer Lake, another beauty with Mt. Bachelor in the background. Another 650 trout were let go here right before we arrived, and they were still jumping for joy. The next day we went for a 4-wheel drive on the back roads near where we are camped. From Klamath Falls we moved north to a casina at Chiloquin. From there we did a day trip to Crater Lake. There is still lots of snow here, but there was a path over to the rim. Crater Lake is the deepest lake in the US - almost 2000 feet deep! It was formed when Mt Mazama blew its top 7700 years ago. It then filled with water. Wizard Island erupted after the lake began to fill. Looking beyond Wizard Island, you can see Devil's Backbone. Floating in the water was some really pretty something - pollen? moss? I never got the answer. Although a road goes around the crater, only the west side is open now. They're still working on clearing the snow on the east side. As we drove around the west side, the road rises and the snow becomes deeper. The lake holds 4.9 trillion gallons of the most pristine water. As we got higher, it was possible to see the crater on the top of Wizard Island. After lunch along the rim, we headed back.